Honey is the first and most obvious product that comes to mind when thinking about bee products. It is readily available in grocery stores and many people use it as a sweetener in place of refined sugar. Honey is the food that bees make by collecting nectar from flowers. They turn the nectar into honey by regurgitating it and letting it evaporate to concentrate the sugars that make up its primary ingredients. In addition to sugar, honey contains trace amounts of vitamins, minerals, fiber, protein, and other substances. The flavor of honey is distinctive and a nice alternative to the other sugars. But honey’s benefits go far beyond flavor and sweetness. Honey has numerous health benefits, both as something you can eat and as a topical medication. Be aware, however, that the honey you use should be raw and unprocessed. Antioxidants. Honey is rich in antioxidants, which help to repair damage done to our bodies by environmental toxins. The darker the honey, the more antioxidants present in it. Allergy relief. Raw and unprocessed honey contains allergens from the environment, including pollens, mold, and dust. If you eat a little bit of unfiltered honey that was produced in your local area every day, you will find that you get relief from your allergy symptoms. By dosing with allergens you build up a natural immunity to them. Digestive health. Honey has been shown to improve digestion in two ways. In the upper gastrointestinal tract the antibacterial properties of honey can reduce levels of bacteria that cause ulcers. In the colon honey provides probiotics to aid digestion. Healing wounds. As a topical ointment, honey can be used to treat wounds. It has antibiotic effects and keeps wounds clean so that they can heal more quickly. Anti-inflammatory effects. Acute inflammation is a natural part of healing, but the low-grade, chronic inflammation that afflicts so many Americans due to poor diet is damaging. Honey is known to reduce the chronic inflammation in arteries that contributes to heart disease. It also stabilizes the ratio between good and bad cholesterol. Cough suppression. The next time you have a cold add a teaspoon of honey to a cup of hot tea. Honey suppresses a cough and there is also some evidence that it may help to heal a cold and reduce its duration. Type-2 Diabetes. For people with type-2 diabetes, it is important to not flood the bloodstream with sugar. Honey is released more slowly into the bloodstream than refined sugar, which makes it a better choice for diabetics. Bee pollen is different from honey. It is the pollen that bees have collected from flowers and packed into small granules. For the bees, the pollen balls are stored in the hive and used as a source of protein. As they pack the pollen into the hive other components are added to it including enzymes from the bee’s saliva, bacteria, and nectar. For humans, bee pollen is a nutritional powerhouse and there are many reasons to use it as a part of your regular diet. It is important to know that bee pollen is not found in other bee products like honey and royal jelly. Also beware of bee pollen products with additives. These are not natural products and may even be harmful. Complete nutrition. Bee pollen contains all of the nutrients we humans need in it small granules. It has protein, carbohydrates, fat, antioxidants, vitamins, and minerals. It is a complete food. Weight control. Bee pollen has been found to help people lose and manage weight when used as a supplement to a healthy diet and regular exercise. It may help by stimulating the body’s metabolism. Digestive health. Research has shown that eating bee pollen can improve your digestive health. This may be explained by the fact that it contains fiber as well as probiotics. Anemia. Anemic patients given bee pollen experienced an increase in red blood cells in the bloodstream. Why this happened is not understood, but bee pollen supplementation seems to help people with anemia. Blood cholesterol levels. Bee pollen as a supplement has also been shown to regulate levels of cholesterol in the blood. It causes the levels of good cholesterol (HDL) to go up, while the levels of bad cholesterol (LDL) go down. Cancer prevention. In studies with mice, bee pollen in the diet prevented the formation of tumors. Longevity. Numerous studies have shown that bee pollen contributes to the slowing of certain aging processes. It seems to boost memory, stimulate metabolism, strengthen the heart and arteries, and provides nutrients that many people lack as they age. Not to be confused with honey, which feeds the worker bees, royal jelly is the food for the queen bee, as well as the larvae in a colony. Royal jelly is one of the factors responsible for transforming a larva into a queen rather than a worker bee. The composition of royal jelly includes water, protein, sugar, a little bit of fat, vitamins, antioxidants, antibiotic factors, trace minerals, and enzymes. It also includes a compound called queen bee acid, which researchers are investigating, and which is thought to be the key to transforming an ordinary honey bee into the queen. Skin care. Royal jelly can be found in some topical beauty products because it may help protect the skin from the sun. It may even correct some of the damage already caused by the sun, including restoring collagen and reducing the visibility of brown spots. Cholesterol. As with both honey and bee pollen, consuming royal jelly has been shown to balance out good and bad cholesterol in the blood. Anti-tumor properties. Some studies have shown that royal jelly, when injected into cancer cells, can slow the growth of tumors. Reproductive health. Some proponents of royal jelly say it can improve a woman’s fertility and even relive symptoms of PMS. Digestive health. Royal jelly is also known to be able to soothe a number of stomach conditions from ulcers to indigestion to constipation. 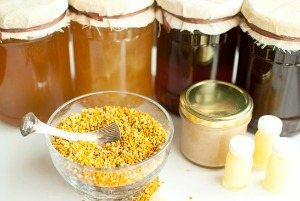 Raw, organic, and unprocessed honey, bee pollen, and royal jelly are all relatively easy to find at your favorite health store, or better yet, a local beekeeper. There are a few other products made by bees in the hive that are not as well studied and which are not as easy to get your hands on. Propolis, for instance, is the resinous material that bees make from sap and which they use to seal small cracks and holes in the hive. For humans, propolis can be used in topical applications. It is not a nutritional food product, although it can be used to make chewing gum. Propolis has antibacterial properties and has long been used as a topical remedy for wounds, acne, and skin rashes. Limited evidence shows that it may also help to treat herpes, tooth infections, and inflammatory diseases. The proof is not conclusive, but propolis is safe to use. Beeswax is the fatty substance that bees use to make up the bulk of their honey combs. It is not edible in the sense that it is tough to digest. It isn’t poisonous, but you won’t get much nutrition out of it if you try to eat it. What it is good for is making natural cosmetics, soaps, creams, and candles. Honey, bee pollen, and royal jelly can all be added to your smoothies. The great thing about bee pollen and honey is that they taste great as well as giving you wonderful health benefits. Bee pollen is not as sweet as honey, but it does have a nice flavor. It is a rich food, so introduce it slowly. Start with a few grains at a time and gradually increase the amount you use to between one teaspoon and one tablespoon per smoothie. Try blending bee pollen into your smoothies and sprinkling on top like sprinkles on ice cream. For all of my smoothie recipes featuring bee pollen, click the link below. You can add honey liberally to your smoothies in place of any other sweetener you might use. It marries well with all other flavors, but can also shine on its own. Always look for organic and raw honey and if you can find a product made locally, that’s even better. Check your nearest farmer’s market for a local honey. The flavor of royal jelly is not appealing to everyone. It can be tart, and as some describe it, a little fishy. The good news is that you only need a little bit of it (about a teaspoon per smoothie) to get the health benefits and you can mask it in your smoothie with stronger flavors. In fact, try pairing it with honey to hide the flavor. Bee products are remarkable for their nutrition content and ability to heal the human body in a number of ways. Always be cautious when using these products if you are allergic bees or think you might be. While rare, if you are allergic to bee stings, any one of the bee products may cause you to have a reaction as well. What is your experience with bee products? Do you have a favorite? Please do tell by leaving a comment below.